Both rustic and elegant, this is a theme that is trending for a look that is traditional in an ancient sense and also quite modern. During Yule season, bringing evergreen branches into the hall, while imagining that the animals were speaking and joining the warm celebrations was incorporated into our Christmas celebrations over the years. Suited to a traditional, casual Christmas look, the motif of forest animals, frosted twigs, and natural objects such as pinecones and greenery is in keeping with how most of us picture a holiday scene. Bring it into your home this year. Our love for natural decorating might stay restricted to the gathering of real materials from out in the garden, but the sugar plum dreams of Christmastime will lend itself to flights of fancy that have forest animals talking and even dressing up in their human counterpart outfits. Like nothing you've seen in the parks near you, maybe, but delightful all the same. I think it is really a matter of what you prefer. To have only gathered items from woods and field is simple, fun, and goes with many styles, or dressing up such items with a little flocking and glitter is still in the stream of the look of a Woodland. It can be traditional or most modern in feeling. It fits well with Country or Victorian rooms, and related decorating schemes. I personally have a mix and match style that reminds me, sentimentally perhaps, of celebrating Christmas throughout my lifetime... From my grandmother's decorations to those my children happily made in Sunday School. I have always had a soft spot for pinecones (despite their prickly nature), so this forest themed style is one that I naturally incorporated into our own holiday decor. When decorating with a forest in mind, nothing brings the feeling of being deep in the woods like patches of moss. It is easy to obtain all sorts of lichens and mosses in hobby stores or even at your favorite discount store. Apply it to centerpieces, beneath flower arrangements or as a base for a wreath. Use it around your Christmas village when a bit of green is called for, it gives an immediate woodsy accent to any place in the house. What makes this look? There is a light airy feeling to incorporating bare twigs among the greenery, a spare look to how many ribbons or manmade ornaments are inserted into the design. Red color is from berries. Glitter and glitz looks as though sun were shining on ice crusted snow. It makes you feel as though you had stepped outside on a frosty December day. Stags and their offspring are favorite Christmas decorations since they are related in our minds with reindeer, that traditional Christmas motif. Somehow, we most identify them with winter, too. This makes them a trendy holiday theme, and they can be found in an array of candleholders, ornaments, and emblazoned on holiday servingware. There is no reason to pack them away after the celebrations are over, either, as they can decorate any season and gracefully adorn mantles and bookcase shelves, depending on how you wish to use them. The point is that this is one trend useful for far more than just Christmas time. Old World Christmas Fawn Ornament Old world sleeping fawn ornament brings a sentimental touch to the tree. Such a sweet bulb for this theme. The colors are both subtle and contrast well with a tree. Flocked pine needles, generous additions of pinecones, an array of wild animals, and an enchanted forest seems to have sprung up for the holidays. How do you flock your own? For cones: use textured paint spray, lightly spray your cones in a well ventilated area. Whether you buy or create your own, the charm of this theme is undeniable. It is easy to collect a variety of decor, and it is especially harmonious with dens, vacation homes, and family rooms. Not that you are restricted in where to use the woodland creatures and the rustic burlap or flannel plaid fabrics! Animal lovers will have a heyday with the many beautiful ornaments that can be featured on tree, mantle and in tabletop scenes. The fox is fascinating, and his rusty color co-ordinates with "Christmas red" of berries and bows. Darling red fox imparts subtle red color to the tree. A standout ornament for a natural tree theme. 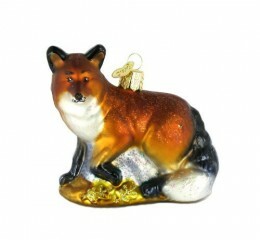 To continue the woodland animals motif, this fox is outstanding in color and detail. Some collect Teddy bears, but this is a replica of the real thing. 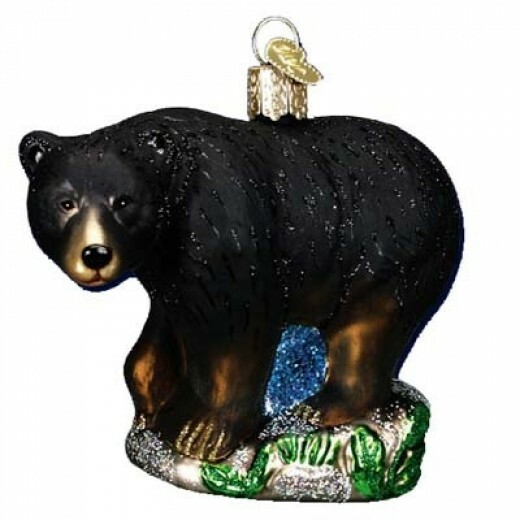 Every woodland ought to boast a black bear embellishment. Their shape speaks of the Northern woods, right along with the moose and deer. The black bear is a resident of the Eastern USA, while a Grizzly harkens to the West. The glass ornaments remind one of old world German manufactured baubles of times past. They have pretty sheen and color and plenty of detail. These are mouth blown glass. Real Grizzlies don't need a red scarf! But this is the magical time of Christmas, when animals talk, and reindeer have red noses. Why not dress your bear up with his own knitted scarf? What Sort Of Berries Bring Sparkle And Color? Holly berries have always been favored, but there are other berries that create a welcome bit of color. I love pink pepper berries. Harking back to Ye Olde England, where decking the hall meant gathering natural elements from the woods, this is one of the most traditional of Christmas themes. And yet, it is also fresh and modern, fitting in with our own environmental sensibilities and longing for communing with nature. With central heating the garlands of evergreen branches may not be the most practical way to embellish our holiday rooms. 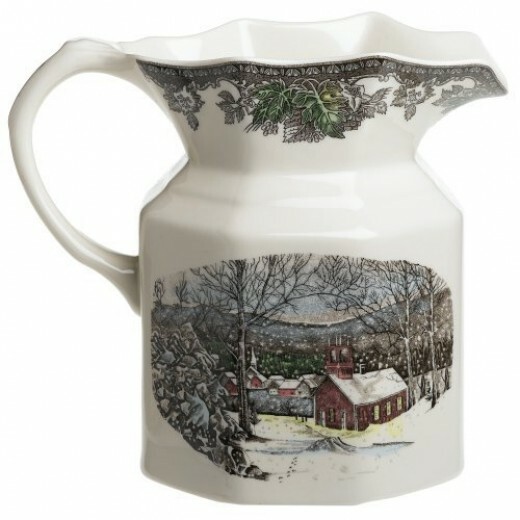 But drawing on elements of design that are in classic dinnerware designs, or the many accessories that have mimicked pine or holly will brighten the interiors of our homes in much the same way that our ancestors sought in Yuletides past. This brand is known as one of the premier in dinnerware. The winter bird pattern makes an elegant display that sings with the color and cheer of the season. Touched with gold and red ribbon, this is a beautiful design for a fine dining display. A pattern that harks back to memories of Currier and Ives prints, Grandma's best laid table, and Victorian celebrations of a warm family Christmas. The holiday table for many boasts one of the Johnson Brothers designs. I love their Victorian home look, with a transferware style that mixes with most traditional interior designs. Friendly Village is one of the beloved designs to bedeck tables during both Thanksgiving and Christmas feasts. Using a set of serving pieces can add a festive seasonal look to an all white ironstone place setting. Or it amy beging a year long affair with this homey traditional pattern. It may be necessary to look for some of your dinnerware designs on eBay or similar sites. 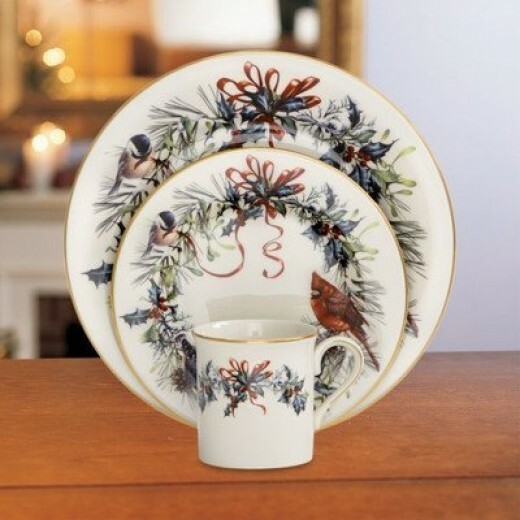 I think the Spode Woodland Christmas Tree design is beautiful for this theme, but it is hard to source all the desired items ( I thought the set of mugs were a wonderful addition to other sets or just for a holiday morning brunch coffee. 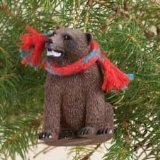 Whether you buy them or make them from pinecones, etc... forest animals are adorable on the tree . 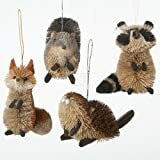 Each of our favorite little woodland animals- fox, raccoon, beaver, and squirrel - all ready to hang out in the Christmas tree. Or the beautiful Arctic fox, with just the right winter coloring to stand out against the pine branches. A paper mache reindeer in natural color or painted by you. Using walnut shells, as they are or gilded a bit, can be transformed into cute ornaments or added to wreaths. Tussie mussies made of burlap and filled with dried flowers and sprig of twigs., hung on trees or on a door. It is time for some easy creativity. Try this idea, or start a collection of them on a Pinterest board. Found items, inexpensive repurposing, all combine to make this one of the most frugal ways to spruce up your Christmas decor. For many, the figure of Father Christmas lends traditional glints of jolly celebration and anticipation of goodies. So it isn't any surprise that many rooms find a place for a special vignette featuring him. While there are innumerable renditions, the ones that are dressed like a woodsman come fresh from Alpine workshops look just right for our theme. 32" Alpine Chic Beige and Brown Burlap and Corduroy Standing Santa with Snowshoes and Gift Bag Carrying pine boughs or teddies, laced up in snowboots or furry winter coat and hat, these Santas can become the center of attention when surrounded by greenery, baubles, toys or on their own. Welcoming in an entry or on a mantle, there are plenty of ways to add this icon of the season into your decorating plan. Consider scooping up some craft projects for next year's decor and gifts. Homespun gifts and embroidered ornaments can be easy to make, and an early start in the year gives plenty of time to exercise creative impulses for rustic and natural decor and gifts. Are you crafty and inclined to create ornaments and table decor? Consider some needlecraft projects that are welcome in your own hall or as gifts to lucky friends and family. It maybe too late to finish these for this years plans, but not too early to start for next year. Does your family enjoy puzzles? 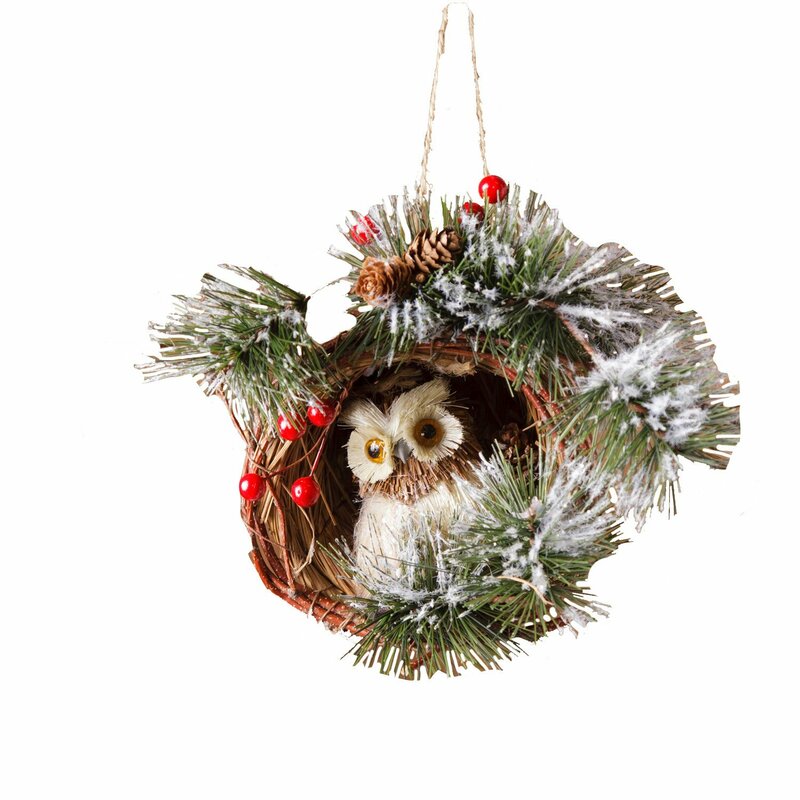 This year have one that matches the decor theme and brings a wintry scene indoors. Pretty enough to hang on the wall after its finished. Every year my family loves to keep busy on Christmas Eve, gathered around a jigsaw puzzle, while I finish up making my family-famous Cardamom Rolls. It was always a great way to keep the kids busy and added to the holiday spirit. Purple might seem a surprising choice for the rustic look of Woodsy themes like this, but it is that element that makes it an exciting way to change things up. Bring out the tones of the other traditional motifs of green pine and snow frosted branches. Bringing a little color and glitz to a Woodland theme may not be your cup of tea, but it can give you ideas on how to imprint the look with your own special touch. Because you can forage parks and backyards for supplies, and craft many of your own decorations, this is quite possibly one of the most frugal of holiday decor schemes. It works beautifully with the "Lodge" styles that work so well in Western and Northern USA homes. I would dress it up a bit for a Southern style that uses Magnolia leaves and other traditionally southern elements. We ought to recognize its place in the "Olde English" Christmas customs of bringing plenty of fresh greenery into the home. The branches and twiggy looks make wonderful vase arrangements that are often a feature in British interiors, too. I hope you enjoyed this showcase of forest friends and nature's beauty. It seems like one of the more delightful ways to bring a holiday trend into the celebration of Christmas. The rustic look goes with so many interior styles and the colors harmonize with any bright accent. It seems almost magical, and as if the little animals could speak, as they are said to do on Christmas night.